Sebastian Blanco struck just moments into the second half on a gorgeous curler from beyond the penalty area, and the Portland Timbers held on for a 1-1 draw at FC Dallas despite finishing the final 15 minutes with 10 men. Blanco's left-footed strike beyond the dive of Jimmy Maurer marked his second goal in three games for the Timbers, who earned their first point of the season in the third fixture of a five-game road trip to open 2018. He remains the only player to hit the net this season for Portland, while Diego Valeri remains silent so far in defense of his 2017 MLS MVP award. 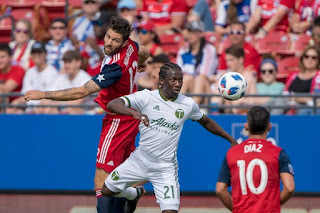 Roland Lamah scored early for Dallas, who played up a man after Lawrence Olum received his marching orders for a deliberate handball – and second bookable offense – in the 75th minute. Dallas remain undefeated three matches into their new season, but will probably consider Saturday's match two points lost after outshooting Portland 13-11 and holding 61 percent of possession.